Expert tip: This is one of the most popular yoga retreats offered in Chile. If you’re ever coming to the Chilean North, we have an economic and unforgettable Yoga experience for you. Eco Yoga retreat in the Mamiña Valley, 800 ft. above sea level. Pre-Inca civilization landscape with mystic healing and rejuvenating ground waters. The site is 75 miles away from the city of Iquique, where you’ll find Peace, Silence, and Serenity. You will have Daily Yoga practices and Meditations for both beginners and advanced practitioners. 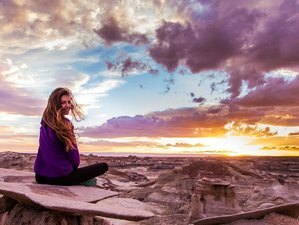 Also enjoy the nature of eco-tours and Yoga practices in the desert, as well as spa treatments which may include mud baths and thermal waters. Spa treatments: Aromatherapy, Ayurvedic Oil Massages, Shiatsu, Medic Hydrology, Reflexology. Yoga mat and sitting brick. You may rent it with us if you don’t have any. Yatratours offers unique experiences and wellness tourism in Northern Chile, based on the study and practice of Sivananda yoga and personal development.